I seem to visit this topic often, especially when I’m decorating for a new season, but it’s something that I’m still trying to work through myself…small space decorating challenges. Over the 29 years we’ve been married, we’ve lived 10 different homes, with the largest at 3500 sq. feet and the smallest, our current home, just under 1200 sq. feet. In our largest home, we had so much space that I had to buy “stuff” just to fill some of the least used rooms in the house. In that house, the decorating challenge was that there was almost too much decorating space. In the house we are in now though, I’ve had to learn how to decorate in a different way. I am someone who enjoys decorating and moving things around a lot, like furniture and pictures. My go-to pick me up for a room was to move the furniture around, change a few accessories and BAM, you had a new room for no money. When you live in a small space, there’s no moving furniture around, because it usually only fits in one spot, and you have limited space for decor, so you have to be choosy about what you display. In my current living room (the biggest room in the house) I only have 3 areas, which consists of 2 chests and a tray on an ottoman, to display lighting and a few decor items. Not a lot of space for someone that likes to change things up. So instead of moving furniture, I have found that rotating my decor, either monthly, or sometimes, every other week, allows me to change things up a bit. 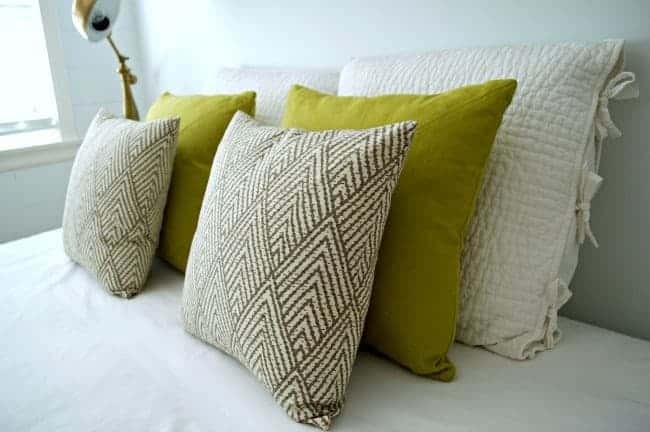 I’ve also found that by keeping larger items neutral, like the couch, rugs and bedding, and by keeping my color palette cohesive throughout the whole house, I can switch out the pillow covers or accessories in any room and have an instant change without a lot of expense or effort. Now, when I shop online or in a store and I see something that think I would be perfect for my home, I make sure that I have several places to put it in any room of the house, and that I love it…really love it. 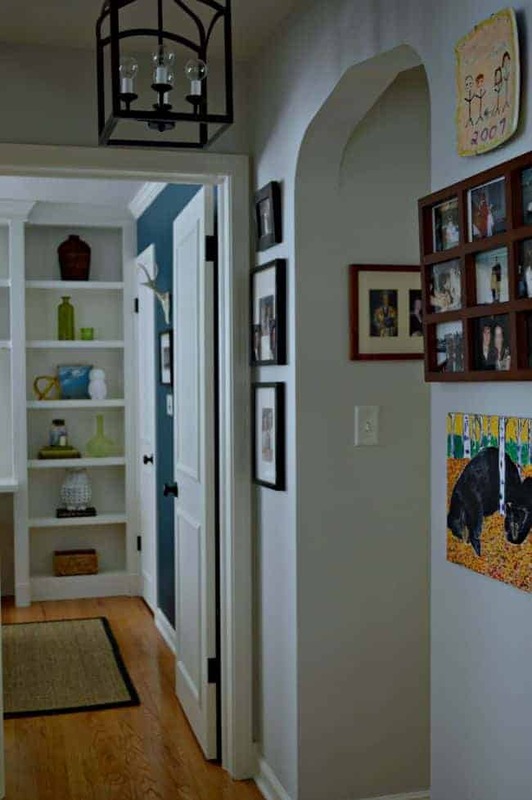 Big home or small space, what decorating challenges do you have? I hope you have a great Labor Day weekend. I don’t want to jinx it, but we are supposed to work on our countertops this weekend. Fingers crossed. Great tips, and your house is lovely! Thanks for sharing! I live in an old 1970s trailer that we’re working on renovating with my hubby, 6 kids, and 2 pets with less than 1000 sq ft, so I can relate. I’m enjoying the challenge though! Hi Kristi! I hear you, girl! 1186 s.f. here, for 29 years now. The only things that get moved around here are tabletop displays and pillows, lol. But there’s nothing as charming as a little cottage, right?! I’m loving your sweet home and your photos are gorgeous! Hi Andrea, so nice to meet a fellow small space dweller. 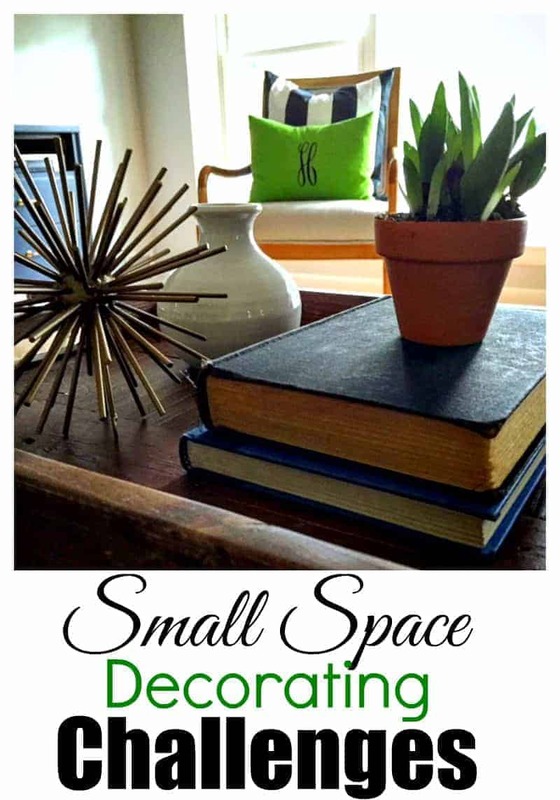 😉 I’m sure you know all the tips and tricks to decorating a small space. It’s been a learning experience for sure but, you are so right, there is nothing as charming as a little cottage. Thanks so much for your sweet comment. I’m so glad you came to visit. We have a fairly large home and I wish it were smaller. Great ideas and everything looks wonderful. Thanks Pamela, so nice of you to say. I was ready for small, but getting used to some of the challenges that come with it has been a process for sure. I’ve often envied those who have a large home, thinking, oh, what I could do with that . . . then I come to my senses and realize it’s more work to keep clean, more expense to heat, cool and maintain. 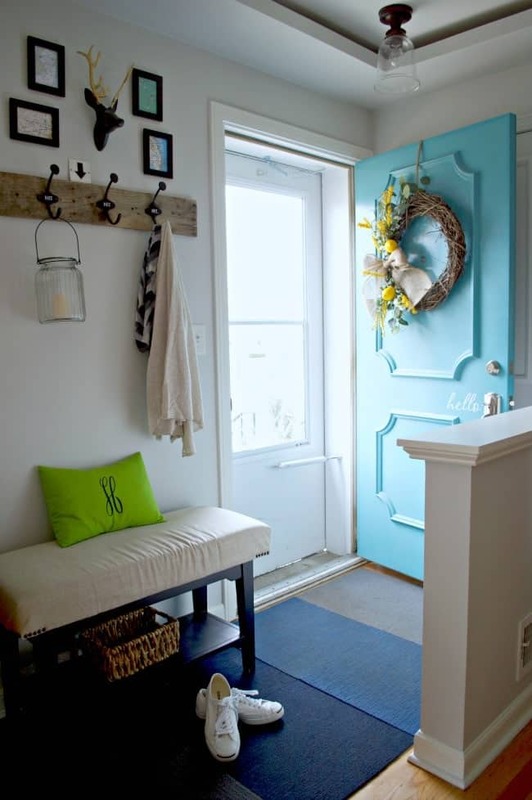 Of course, there are things I wish were different about my home, see I don’t have a linen closet and my hall closet is over the stairs to the basement and has a slanted floor so I don’t have any floor space in it. I have learned to work around those things and other than those two disadvantages I love my home. We have 2 acres and I love sitting in my backyard where it is so peaceful. So. . . what were we talking about . . . oh, yeah decorating small spaces. When I have the time, I do move things around, luckily I have hardwood floors so it’s easy to move furniture, but you are right, there isn’t too much things you can do with rearranging a room in a small house. 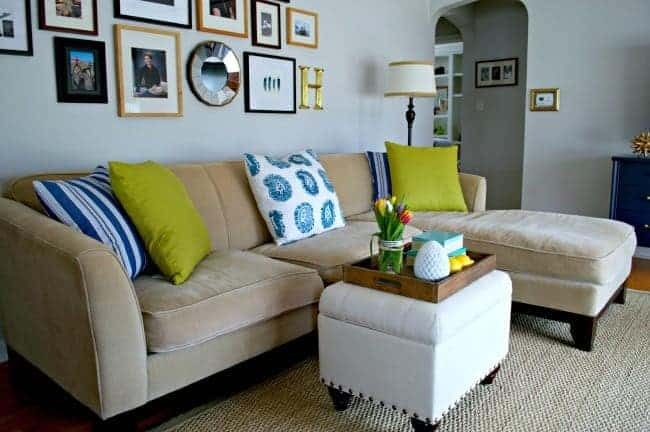 Right now I’m thinking about changing out my sofa pillows for the fall and changing my hutch decorations. As you know I work full-time so sometimes it takes me awhile to do even that. Today I will be cleaning and going to a party later, but tomorrow I will maybe work on my bathroom redo, if the kids don’t come over and I’m preparing for my annual Halloween party next month for the grandkids. Always something to do, can’t wait until I retire! I have a long list of things to do when I retire and it keeps getting longer! Enjoy the holiday weekend, my friend! You’re lucky that you can move some of your furniture. I try to figure out different places to put mine, but so far it hasn’t worked out. I’ll keep trying though. I know you are ready to retire and I’m sure you’re list is very long. You’ll tick things off so quick once you have the time. Here it’s itchen reno stuff again. We are both stressing about the state of the house and we need to get it done soon. I hope you’re enjoying this long weekend and thanks so much for stopping in to say hi. Have a great Monday! I never thought it would be this difficult, but having a blog where you need to decorate and change things around for pictures, makes it more difficult. I’m not complaining because I love what I do, just like you love fabric and quilting, and, after all, isn’t that what life’s about? I always appreciate your visits Debbie. Hope your weekend has been a good one. Ha, love that Pat and I agree 100%. I don’t have a whole lot of vertical floors, but I try to make the most of what I do have. Thanks for that and for dropping in. Happy weekend! Hope you have a great weekend Kim! Small spaces have always been my thing. And by that I mean my living quarters. I used to love rearranging my bedroom as a kid – and luckily had linoleum-esque floors, so even the giant bed could be pushed around with enough effort (old wooden sleigh beds are heavy!). But, I’m still not much of a decorator. My idea of a pretty shelf is my DVD/video game shelf – which is organized by media type, and then there are some figures in front of less played games. It’s cute, it fits our “aesthetic”, but it’s certainly not real decorating (some of those figures are for games, after all, ha!). I’ve been debating decorating the living room, as we have a giant couch now, and it’s just begging for some pillows and another blanket, but haven’t gotten the motivation to do it! Thanks Jessica. I hope everything works out. I used to do the same thing with my bedroom when I was growing up. It drove my mom nuts but I loved to see what I could do by just moving things around. Thanks for stopping in and I hope you have a great weekend!